Within a few months of opening our doors in March 2016 we started putting beer in oak barrels at The Virginia Beer Company. There's nothing particularly ground-breaking about barrel-aging high gravity beers. Pretty much every brewery is doing it, and for good reason - the results can be delicious. In July 2016 we started the Barrel Fermentation Project. While most barrel-aged beers are fermented in stainless steel tanks, and then fully fermented beer is racked into oak to age, this project is a little different. Taking inspiration from old world brewing techniques, the Barrel Fermentation Project fills used wine barrels with freshly cooled wort direct from the brewhouse, completely bypassing the stainless cellar tanks. Once in the barrels the wort for Batch I was inoculated with a variety of yeasts including multiple strains of Brettanomyces, a "wild" Saccharomyces strain, and Saison yeast. Spontaneous fermentation, this is not, and does not pretend to be. Known cultures were pitched with intention and flavor profiles in mind. That said, there is a definite lack of control involved in this project and that makes it that much more exciting. So much of my day as a brewer is about controlling fermentation - yeast cell counts, fermentation temperature profiles, sanitation, gravity readings, QA/QC lab sampling/incubation, etc. The Barrel Fermentation Project gets rid of most of that regimentation, instead leaving the blend of yeasts to do their own individual thing as they will over time. On the day we pulled Barrel Fermentation I from the Hungarian Oak red wine barrels for packaging, we were simultaneously brewing another batch, Barrel Fermentation II. As soon as the barrels were empty they were refilled with fresh wort for Barrel Fermentation III. Refilling the same barrels allows the now resident yeast culture in the barrels to take over with no additional yeast being added. We'll see what happens with this one and let the beer and the barrels tell us when it is ready! This first release is one of my favorite beers that I've ever had a hand in producing, and I hope everyone enjoyed it as much as I do. I think it had just the right amount of Brettanomyces fruity funk to complement (but not overpower) the Nelson Sauvin hops and oak character. Barrel Fermentation II (also brewed in July 2016) has been tasting quite nice out of the barrels. It has since been kegged and bottled, with an infusion of Brett Brux directly into the bottles to add a component of bottle-conditioning to this project. The bottle-conditioning will produce even more of the trademark esters and phenols that often mark a "Brett beer" as funky with hints of tartness. Entirely approriate to enjoy now or to cellar for a future occasion, look for the bottle releases of Barrel Fermentation II, III, and IV - all blends that have fermented for months in Williamsburg Winery French & American oak red wine barrels. No promises on when Batch V will be ready - time and wild yeast will tell. Cheers to lack of control and more barrel fermentations! Bad news, my friends. We're out of Free Verse India Pale Ale cans. "But you guys canned a fresh batch on Wednesday, right?" Yes. Yes, we did. But we can't sell it to you yet. We take quality control very seriously here at VBC. From our raw ingredients and water, to our cleaning regimen and packaging, quality control is our number one concern, especially with our growing Brettanomyces barrel-fermentation program (more on that later). Every batch of beer we produce goes through rigorous, in-house microbiological lab testing to ensure that the beer is as intended and infection free. Unfortunately part of this process involves time. After we move a batch of beer to the brite tank we take aseptic samples of the beer. To ensure sterility of the sample, we flush the sample valve with 70% isopropyl alcohol and flame the port with a propane torch. After cooling the sample valve by running beer through it, we collect an aseptic sample for testing in the lab. This sample is then added to two different selective media - one of which tests for lactic acid bacteria (lactobacillus and pediococcus) and another that tests for wild yeast (Brettanomyces). Here's where the time part comes in... It takes a minimum of 4 days of anaerobic incubation at 20°-25° C to determine if there are beer spoilers in the beer, so we hold beer in the brite tanks for that long before we will ever package it. Once it clears this test (which thankfully has always been the case - knock on stainless AND wood), we are ready to package into kegs and cans. After canning we take more aseptic samples from multiple cans and repeat these microbiological tests and incubation time. This of course brings us back to the beginning of this post... We're sorry, but even though Free Verse cans are full and cold in our cooler, we cannot, in good conscience, release this beer until we know it is exactly what we intend it to be (down to a microbiological level) even if it means being out of cans for a few days. We may bend these rules for some very limited runs of brewery-only release cans in the future, but for our flagship Free Verse India Pale Ale that sees growing distribution, there's simply no risking the beer or our reputation simply to get the beer out a few days early. All that said, assuming the lab work comes back clean...we'll have Free Verse India Pale Ale cases in the taproom ready to go on Sunday at Noon for all your Super Bowl shenanigans! I'm an Atlanta guy, so: cheers to high standards for beer quality and the Falcons! While things are getting more and more busy around here working with contractors, engineers and equipment manufacturers, I have still found time to be brewing each week; and we’ve had a fairly good mix of experimental beers possibly destined for our 5bbl Pilot Brewhouse and many batches of our planned year round beers. On the more technical side of things, now that we have our building settled it’s been time to focus on the water chemistry there, so recently we sent a sample out to an independent lab for analysis. I had been brewing test batches from a different water source, so it’s been important to re-brew all of our beers using the water that I’ll be using on a production scale for The Virginia Beer Co. beers. Our water at 401 is actually pretty well suited for brewing- for paler beers it does take a little tweaking to get the alkalinity under control, but nothing drastic, and it is pretty much perfectly suited for brewing darker beers with their more acidic grists, which naturally neutralize some of that alkalinity. It’s definitely been a chore collecting water for brewing ahead of time, but it’s worth the effort to be able to understand the needs of our brewing water prior to our opening! Brewing of course is part science and part art, so let’s move on to the more interesting artistic side of what’s been brewing in Williamsburg. One particularly fun beer actually came about through conversations with the good folks over at the restaurant, Silt, here in Williamsburg. The VBC team went over there one afternoon to meet their team, and naturally I got to talking with Chef Nelson Miller about beer and food pairings. He mentioned that he had always thought that peppadews (a sweet, red pepper) would make a great beer ingredient, and I was intrigued by the idea. Of course Nelson sent me off with a huge jar of peppadews and I started planning an Imperial Peppadew Porter with the idea that the chocolate malt flavor would balance and complement the sweet, mild heat of the peppers nicely. And of course as I looked more into the peppers, I realized they were pickled… Vinegar and Imperial Porter didn’t seem like such a great idea, but I was happy with the base beer recipe I had written, so I headed to a local market to try to find fresh peppadews, but had no such luck. While wandering around the market looking for something interesting to add to the Imperial Porter I had designed, I came across Goji berries. Known as a bit of a super-fruit for their high nutritional value, Goji berries are a small red berry native to China that have a mildly tart and somewhat bittersweet berry flavor. They seemed like a perfect match for the chocolate forward beer I had planned! On the brewday I packed the hopback vessel full of the dried berries and ran the hot wort through the vessel extracting the berry flavor (and a bit of their red hue) just prior to cooling the wort on it’s way to the fermentation vessel. The beer was a total experiment, and the results were quite nice. Goji Porter clocked in around 8.6% ABV with a nice tart and slightly sweet Goji note in the background and beautiful red highlights in the glass. It may not have been the beer Nelson and I initially envisioned, but without that collaborative conversation, the beer never would have come into being… And I hear he’s working on sourcing some fresh peppadews, so fingers crossed for that! Another more experimental and collaborative beer came through the taps recently. One of our main hop suppliers,47 Hops, sent me some samples of a new hop variety called Pekko (pronounced “peek-o”) to try out. Having never used the variety before, I was very excited to see what they were all about, so I devised a fairly straight forward malt-bill in order to let the hops shine. The finished beer had a very distinct peach aroma and flavor from the hops that was quite pleasant! A perfect example of a beer that would fit in one of our planned taproom series of beers, a line we’re calling Single Hop Sessions. It should be a great way for taproom drinkers to explore the wide variety of hops available on the market! One other intriguing beer that I’ve been quite pleased with of late is another iteration of our rotating Saison Tournante series. Our citrus peels supplier sent us some dried tangerine peel a couple months ago, and the aroma of tangerine just begged for warmer weather and a saison! As soon as the spring started to come about I propagated saison yeast that I had saved from the fall and got to brewing. In addition to the tangerine peel, I also used Australian Galaxy hops, which have a distinct tropical fruit aroma and flavor. The resulting beer pours a hazy orange and has an intoxicating tropical tangerine flavor and aroma that are perfect for drinking outdoors on a beautiful day. That’s all for now… It's been an adventure brewing full time with The Virginia Beer Company, through our first collaboration with Twain's, along with all the 20+ (and counting) styles and recipes we continue to develop and refine. And the adventure continues: time to head to the building to filter and collect water for Monday’s India Pale Ale brewday! With all the small batch pilot brewing I’ve been doing (with a little production-scale collaboration on the side), I’ve just been dreaming about the day I get to brew on a production scale again, and we are now one step closer to that happening as we put in our down payment for the brewhouse and tanks earlier this week! After working with a few different equipment suppliers to design our equipment, we have settled on DME Brewing Solutions. They make top of the line brewing equipment and have been incredible partners in designing our future brewhouses (that’s right, brewhouses, plural) and tanks. We are going to have two separate brewing systems, one which will cast out 30 barrel batches (930 gallons) for year-round and seasonal series, and a smaller 5 barrel brewhouse for one-off taproom releases, recipe development and limited release wild ales. Having these two different systems is really integral to what we’re trying to do at VBC. We want to be a packaging production brewery, but at the same time, embrace the taproom experience for our customers by providing an ever-changing tap list. Coming from my more regimented production brewing background, I couldn’t be more excited for the creative freedom that the 5bbl system will allow for, while still having the capability to crank out relatively large batches of year-round and seasonal beers. It’s the creative freedom of a brewpub within a larger production brewery- the best of both worlds for a brewer and beer lovers! As for our tank farm, we’ll be starting with four 60bbl fermentation vessels and four 5bbl fermentation vessels as well. At max throughput, which we probably won’t reach in the first year, that’s over 6,000 bbls/year of production with just our first round of tanks...and there’s plenty of room to add more capacity! Installing two breweries in the same facility is not without it’s challenges, though. It makes for much more complex pipework, infrastructure and other engineering concerns in order to allow us to utilize some of the larger brewhouse’s support equipment, such as liquor tanks and grain handling, for the smaller brewhouse. We have a solid plan in place for how the process should flow, but it’s definitely more complex than your average start-up brewery or brewpub system. It should be a fun challenge and definitely worth the effort and expense for the wide variety of beers that having two systems will allow us to produce. With our building and equipment set, here’s to BIG batches and taproom exclusive beers! It’s said so often it’s almost cliché, but the craft brewing industry really is a very congenial and cooperative industry, probably unlike any other. Even the competition, which is certainly growing rapidly, really has a friendly aspect to it. A good example of this is the proliferation of collaboration beers you see across the industry between craft brewers both large and small. Collaboration brewing is a great way to work with other breweries, learn from each other's techniques, talk about recipe development philosophies, and most importantly have a lot of fun! A few months ago my friend Chase Medlin, head brewer at Twain’s Brewpub in Decatur, reached out to me asking if I’d like to come down and do a collaboration with him at Twain’s. Without hesitation the answer on my end was a resounding, “Yes!” Chase is a good buddy from my days in the Atlanta brewing scene, and he makes excellent beer at Twain’s, so I was excited for the project. We decided we wanted a way to incorporate both Williamsburg, Virginia and Decatur, Georgia into the beer. The first idea we kicked around was a Double IPA using hops grown in Virginia, but neither of us was terribly excited about that idea, especially because Chase already keeps a steady rotation of excellent hop-forward beers on tap at the pub. We started thinking about the time of year that we’d be releasing the beer, so something darker and boozier seemed to fit the bill. Chase had the "light bulb" moment that sent us in our ultimate direction- use coffee from a Williamsburg roaster and a Decatur roaster! We both loved the idea and decided a high gravity brown ale would be a unique base style for a coffee infused beer. As the recipe started to take shape it was as though we were reading each other's minds- I suggested using flaked oats to give a smooth mouthfeel and help to cut some astringency that coffee can sometimes add to beers, and Chase suggested using maple syrup as an adjunct sugar source... We were completely on the same page, and Double Breakfast Brown was born. Around Thanksgiving I was going to be in Atlanta for the holidays, so we scheduled our brewday for that week. The brewday with Chase and Assistant Brewer Brad Davis was a great time and everything went smoothly. I brought a Guatemalan coffee roasted by Williamsburg’s Aromas World Coffeehouse. We added this coffee to the mash allowing it to steep with the grains. The brewery smelled amazing with the blend of dark malts and coffee coming from the mash tun. Once we filled the kettle and moved onto the boil, Chase’s Atlanta coffee connection, the roaster from JavaVino arrived, and we began a blending session of different coffees to pick what we would add to the cold side of the process. We ended up going with a Nicaraguan bean and a blend of cold brew and espresso for the final beer. This mixture was to be added to the finished beer in the serving tank. All reports from Chase and Brad say the beer has turned out quite nicely at a robust 9.3% ABV. The release will be this coming Wednesday, 12/17, at 7 pm at Twain's Billiards & Tap, so if you’re in Atlanta definitely come out for the party and try our Double Breakfast Brown! I know I can’t wait to try it. Proper serving vessel - important any time of the day! Earlier this month I had the opportunity to attend the Master Brewers Association of the Americas' Mid-Atlantic District meeting in Northern Virginia. Simply put: it was a fun, informative and certainly worthwhile trip. The first night we loaded up a shuttle from the hotel to the welcome party at Beltway Brewing Company. As we passed beers around the shuttle we realized that of the 15 or so guys on the bus, only one was beardless...clearly he was the only one who was not a brewer. Beltway Brewing is a pretty cool operation. They are a contract brewery, only producing beer for other operations, while having none of their own brands. It’s an interesting business model, and one that will likely gain steam with so many new start-up and expanding breweries. The real treat of the night for me was getting to try a friend of mine’s beer that Beltway produces for him (check out Wooden Skiff Brewing Company when you get the chance)! Saturday morning came bright and early and we headed over to Lost Rhino Brewing Company for the day’s lectures and meetings (and coffee...and later, beer). There were great presentations on everything from beer stabilization aids (including one capable of producing beers with gluten content below 20ppm - which I have used successfully on a homebrew scale for a friend with Celiac disease) to the effect of mashing regimes on sour beers. This latter presentation from Michael Tonsmeire, author of the new book American Sour Beers: Innovative Techniques for Mixed Fermentations, was probably my favorite of the day with lots of practical advice for manipulating the production of different flavors by wild yeasts and bacteria. After a long day of presentations and MBAA district business, it was time for happy hour and an awesome catered dinner. When you fill a room with over a hundred brewers, the beer cooler is a thing of beauty, and somehow it magically refills itself. It was a fun night filled with interesting beers and lots of talking shop with other brewers. It was my first MBAA meeting in my new Mid-Atlantic District, and certainly won’t be my last. There’s such a wealth of knowledge shared at these meetings that I’d seriously recommend joining the MBAA to anyone working on the production side of the brewing business. Jonathan Newman, Actor - Evidence! Last week we shared details of Jonathan's first foray into TV; hopefully you managed to watch HGTV's Elbow Room and caught his virtuosic performance. If not, you are in luck! The video below was tracked down by a friend of the brewery and shows Jonathan teaching the cast a thing or two about brewing beer. The audio and video don't match up very well, but you get the idea! A couple of weeks ago the VBC crew was enjoying some great beer (a home brew test batch of our future Azacca/Chinook IPA) and casual conversation. We know all about Jonathan's talents as a brewer and have done our best to convey his skill and passion to our loyal followers. As it turns out, Jonathan has another great talent that he declined to share with us over the last year and a half! During our conversation, he very casually referred to his appearance on HGTV's Elbow Room. Robby, Master of Social Media Promotion: "Wait, wait, wait - did you say that you were on HGTV? And you didn't tell us?!?!?" It's true, readers! Jonathan had a cameo appearance on the show, which HGTV describes as follows: "In each episode of HGTV's Elbow Room, host Chip Wade helps a family who has outgrown their home devise and undertake an ingenious, large-scale renovation, custom remodel or home addition that's perfectly suited to the family's living needs." We're working on Jonathan's IMDB page right now - please send any glamour shots that might be in the Pace Academy or Sewanee archives! Jonathan made his appearance in Episode HELBR-309H, which features a renovation of an unfinished basement in an Atlanta-area home. One of the main upgrades was the installation of an electric brewing system, so the cast and crew of the show paid a visit to SweetWater Brewing Company (Jonathan's former employer) to pick the brewers' brains about the equipment and the process. Set your DVR to record a replay of the episode (airing on Tuesday, November 18th, at 11 AM EST; and again on Tuesday, December 16th, at 9 AM EST) to get a good look at Jonathan in action! We'll be sure to share further updates regarding Jonathan's acting career in the coming months and years. He's a star in the making! I really have three favorite pastimes- bluegrass music, beer, and camping. I first heard about The Festy last fall when a friend invited me to go; "unfortunately" I had to be in Denver for the Great American Beer Festival that weekend, so I couldn't make it. I can’t really complain though, having Charlie Papazian of the Brewers Association put a gold medal around my neck was a decent consolation prize (and a feeling I can’t wait to replicate with The Virginia Beer Company). I knew upon moving up here to VA that I would most certainly not miss The Festy this year. How could a bluegrass festival in the mountains of Virginia, with a brewpub onsite, not be an excellent weekend? My friend (who will remain anonymous to protect the innocent) and I packed up her car and headed for Devils Backbone Basecamp on Friday night. We got a late start on a rainy night, but made it up there by midnight. We got our camp set up and headed off into the muddy darkness to find some fun… It wasn’t hard (and brewers boots were excellent for muddy trekking). There were picking circles around campfires throughout the campgrounds, and we had a blast wandering and making new friends and trying new beers, even if it was pretty much a steady downpour by the end of the night. Saturday was our day to really take in all The Festy had to offer, both in music and beer. We woke up to a little light rain, but it cleared pretty well as the day went on. A really good cup of coffee and some breakfast from one of the vendors, and I was ready for the day. There was great music all day (I especially enjoyed discovering the Shook Twins for the first time), but the real excitement was the Infamous Stringdusters’ headlining performance on the main stage that night. They killed it- even throwing in some John Hartford and Bob Dylan covers on top of all their originals. It was a fantastic show made all the better by the great location, people, and of course copious amounts of Devils Backbone beer. It’s hard to argue with a DB Schwarz Bier on a cool October night while dancing to high-energy bluegrass music. Another really cool aspect of The Festy is their emphasis on environmental sustainability. They have completely done away with plastic cups and bottled water at the festival! With your ticket purchase you’re given a stainless steel pint glass from Klean Kanteen that you use for all your beverages for the weekend, including free drinking water stations in the concert area and campgrounds. I wish more festivals would follow The Festy’s lead on this one! The folks at Devils Backbone deserve some serious credit and a sincere thank you for helping to stage such a great festival. I’ve been to festivals all over the country, including in the beer mecca that is Oregon, and I’ve never seen such a variety of beers available at a music festival. It was a serious treat and quite impressive! I know I will never miss another Festy Experience at Devils Backbone… Neither should you. This first month and a half in Virginia has been a whirlwind of pilot batching, and even with the challenges of brewing on a small scale, it's been quite fun. 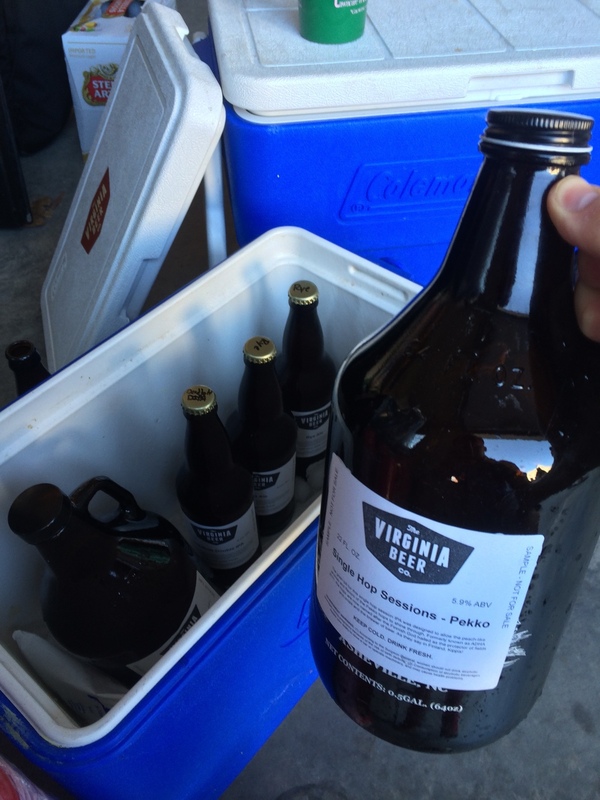 One of the things that drew me to The Virginia Beer Company over other projects was the emphasis placed on having a variety of beers. While we will certainly have our core, year round beers (more on those later), we want every visit to our taproom to offer beer lovers something new to try. My early pilot batch brewing has definitely been reflective of this philosophy, and it has been a fun change of pace from my more regimented production brewery background. At two private parties we have served our Citrus Wheat and IPA; along with the first iteration of our rotating Saison series, Saison Tournant Galaxy/Amarillo; and a Wet-Hopped Cascade Harvest Red (brewed with Virginia-grown hops). The response has been incredibly positive across the board, not only for the individual beers, but for the variety of beers we are presenting. There's more variety to come, as well! Currently fermenting I have an Oatmeal Stout and Hoppy Rye Amber, along with more Citrus Wheat and IPA (including a small batch of IPA fermented solely with the wild yeast, Brettanomyces). We'll have to wait a bit for that one, but I'm excited for the combination of flavors and aroma brought about by Brettanomyces and Pacific Northwest hops. This week will bring a new iteration of Saison Tournant featuring various peppercorns, so I have been hard at work propagating more of our Saison yeast strain! To small batches and variety. Cheers!